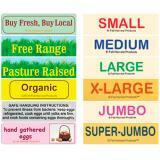 Use bright, colorful labels to promote your eggs at farmers markets and produce stands. 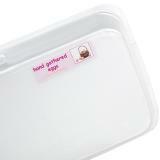 Peel and stick to any paper, plastic or Styrofoam® egg carton. 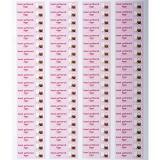 Labels identify size, production style and handling information. Two sizes available: 1.75" x 0.5", (80 per sheet) and 1.5" x 0.5", (100 per sheet). 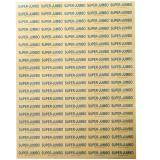 Priced and sold per sheet. 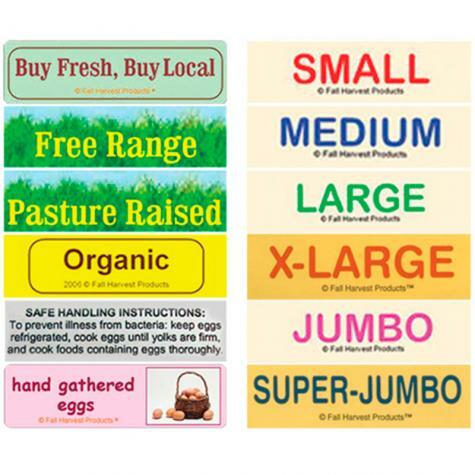 Promote your eggs by identifying the characteristics that make them excellent. Use this kit to clean and sanitize your eggs for resale at farmer's markets, etc. Accurately weigh and sort your eggs by size. Includes chart to determine egg size classification. Use these colorful recycled fiber cartons to protect and package your home-raised eggs for resale at farmer's markets, etc. Egg Stamp - "Free Range"
A fun, fast and easy way to personalize your eggs—stamp them with food grade ink. A fun, fast way to customize eggs with your own logo or phrase. I was so happy to find these, as all I have to do is peel and stick. It would be nice if they were just a little larger, so they were easier to read, but they still need to fit on the lid. 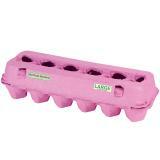 These are very economical and make my egg cartons look more professional.